You can see how many times I have read my copy, that I probably bought for 50 cents at Goodwill. Also, I went through two packages of post-it flags marking all the etiquette bits! 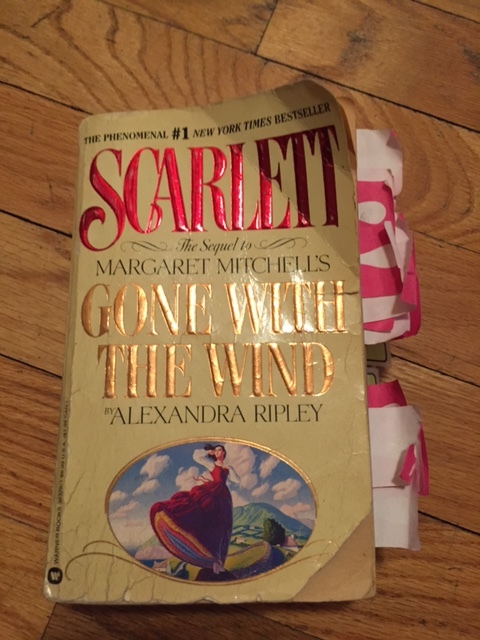 You might argue that Gone With The Wind is a very problematic book, and you would be right, but the character of Scarlett O’Hara has captured a lot of people’s imaginations, including Alexandra Ripley who wrote the completely unauthorized sequel, Scarlett, in 1991. A short synopsis- we start out immediately after the ending of Gone With the Wind- Melanie is dead (spoilers for a 90 year old book! ), Rhett frankly doesn’t give a damn about Scarlett and has left her. As Gone With the Wind was all about Scarlett’s scheming to win Ashley, Scarlett is all about her scheming to win Rhett back. In doing so, she estranges herself from everyone in Atlanta by not following the proper etiquette. She follows Rhett to Charleston, where, for the first time in her life she tries to settle down to be a “great lady” like her mother. After a quick side trip to Savannah, she gives up on Rhett and goes to Ireland to visit her peasant cousins and discovers that not everyone has to follow the stiff etiquette of Victorian America and that maybe she is happier and stronger being who she is. As a pretty fancy lady, Scarlett eventually gets bored of hanging out in the backwaters and descends on the high society of the Anglo-Irish gentry and manages to very nearly become a countess. Rhett rescues her in the end from some revolting tenants and they realize that neither of them want to follow any rules and they go off to be adventurers together. It’s very fun, and Alexandra Ripley seems quite familiar with Charleston and it’s customs (which makes sense as she was from there) and does great portraits of Savannah and Ireland of the 1870s/1880s as well (btw, don’t see the movie, it’s horrible.) What is also great about Scarlett is that Ripley throws a whole TON of etiquette rules and situations in and the fact that I’ve read it…oh a dozen times, probably has contributed greatly to a lot of my etiquette knowledge. The book is really poorly written, I will grant everyone that. I hadn’t really noticed before I was reading it with a close eye to the details, but it is trashy and delightful. However, I was reading it specifically for the etiquette bits and as I was doing so, I realized that you can map Scarlett’s character development almost entirely by how the book talks about etiquette and how she relates to it over the passage of the novel. When Scarlett goes to Savannah, she discovers that she had many O’Hara cousins living there. They provide a huge contrast to the stuff society world that she has been rebelling against. They have loud, fun parties that go late into the night, where the men and women mix, and everyone is allowed to drink. So she goes to Ireland and has a grand time hanging out with all the peasants she is related to. She finally gets to stop wearing corsets and loves the free and happy family relationship she discovers. “They were all wrong! The idea was so explosive that it woke Scarlett from a sound sleep. They were wrong! All of them– the people who cut me dead in Atlanta, Aunt Eulalie and Aunt Pauline, and just about everybody in Charleston. They wanted me to be just like them, and because I’m not, they disapproved of me, made me feel like there was something terribly wrong with me, made me think I was a bad person, that I deserved to be looked down on. And there was nothing I did that was as terrible as all that. What they punished me for was that I wasn’t minding their rules. I worked harder than any field hand– at making money, and caring about money isn’t ladylike. Never mind that I was keeping Tara going and holding the aunts’ heads above water and supporting Ashley and his family and paying for almost every piece of food on the table at Aunt Pitty’s plus keeping the roof fixed and the coal bin filled. They were wrong. Here in Ballyhara I worked as hard as I could, and I was admired for it. I kept Uncle Daniel from losing his farm, and they started calling me The O’Hara. That’s why being The O’Hara makes me feel so strange and so happy all at the same time. It’s because The O’Hara is honored for all the things that I’ve been thinking were bad all these years. Oh, Lord, that’s me. She repeated Charlotte Montegue’s coaching litany to herself. Walk forward, stop outside the door. A footman will lift the train you have looped over your left arm and arrange it behind you. The Gentleman User will open the doors. Wait for him to announce you. Scarlett looked at the Throne Room. Well, Pa, what do you think of your Katie Scarlett now? she thought. I’m going to stroll along that fifty miles or so of red carpet runner and kiss the Viceroy of Ireland, cousin of the Queen of England. She glanced at the majestically dressed Gentleman Usher, and her right eyelid quivered in what might almost have been a conspiratorial wink. The O’Hara walked like an empress to face the Viceroy’s red-bearded magnificence and present her cheek for the ceremonial kiss of welcome. And they go off into the sunrise to, presumably, live happily ever after. So that was really long (it is a 900 page book, afterall), but is one of the finest examples of literary etiquette I know about. And I highly encourage you not to bother reading it unless you really like the genre.